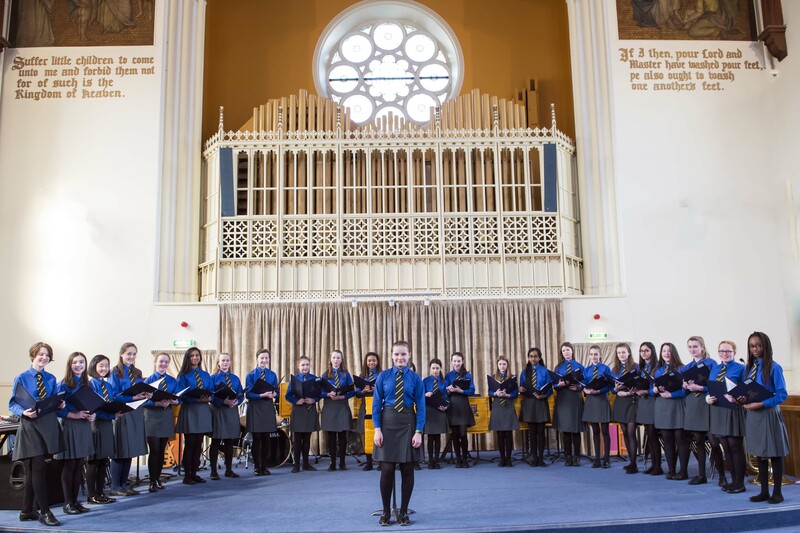 It was easy to forget that the young talent on stage at last Thursday’s Spring Concert was senior school pupils and not professional musicians. Throughout the evening, the girls continued to delight the audience with solo and group performances. The Concert Band kicked off the evening with an arrangement of Rimmer’s Slaidburn March followed by a High School Musical Medley (which I have to admit to humming along to!). Our first solo performance of the evening was provided by Isla who played Saint-Saens ‘Sonata for Clarinet’ beautifully. ‘Kiss Me’ was sung by Lucy, who captured the character and emotion of the song, by Noel Coward, wonderfully. This was followed by a lively performance by the Wind Quartet of Mozart’s ‘Alleluia’ from Exultate Jubilate. Aoife made Tartini’s ‘Affetuoso’ seem effortless, with her violin singing out to the audience like she had been born playing it. Lisa followed with an original piece, ‘The Beat of the Amazon’, on the drums – all I can say is ‘WOW!’. It was a heart-pounding, toetapping fusion of Latin American beats; how she made it look so easy, I shall never know. The Bach Ensemble preceded the Wind Quartet who played the delightful ‘Homage to Beatrix Potter’. Jenna conducted the Senior Choir through her own arrangement of ‘Don’t Stop Believin’’ which revealed we have some very special solo voices within the choir. The piano was expertly played by Tracy with her very aptly chosen piece, ‘Rustle of Spring’. The Jazz Ensemble performed a very slick ‘Mack the Knife’ and the Ceilidh Band proved once again that they would be worthy of a wedding gig any day. Sound of Silence’ by the Vocal Jazz group. After the Vivaldi Ensemble had performed ‘Dargason’, they joined together with the Concert Band to accompany Lisa in her performance of Beethoven’s ‘Romance in F’; a performance that was really quite outstanding and a wonderful end to the evening. To say I was emotional watching these girls on stage is putting it mildly; I had a lump of pride in my throat during every performance. At the close of the concert, Mr Parfitt thanked those VIS girls who would be leaving this year, for all their studying, rehearsing and performing and hoped that music would continue to be an important part of their lives. They each received a posy of spring flowers. Wonderful photos of the event are on the following page.